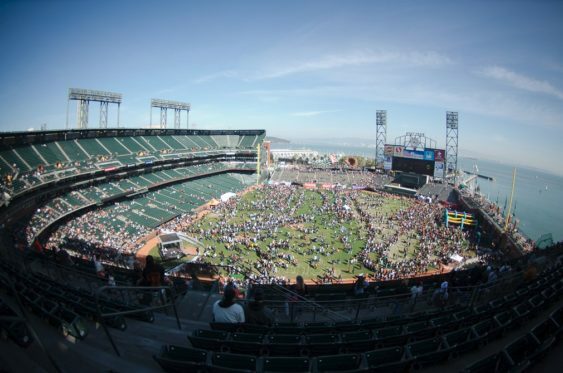 KNBR’s 26th Giants FanFest takes place at Oracle Park (formerly AT&T Park), Saturday, February 9, 2019. The day typically includes live KNBR broadcasts on the field, player Q&As, free player autographs, places to take photos, walk or play catch on the field (weather permitting), self-guided tours, a kids zone and more. Expect a chance to roam the field, plus a chance to take photos with the World Series trophies. Please note that the lines to meet the popular players can be extremely long, so come prepared to be patient. Voluntary donations will also be taken at the Community Clubhouse to benefit the Giants Community Fund and its Junior Giants Baseball Program. Events and locations subject to change due to inclement weather and circumstances beyond the team’s control. Please note the Wall of Fame Ceremony honoring Former President & Managing General Partner Peter A. Magowan has been postponed to a later date during the season. Enjoy the variety of food offerings at Oracle Park. Four entrances will be open for FanFest: All gates will open at 10:30 am. Lines are likely to be long so we suggest getting to the park early. Second and King Street Gate (Second and King streets). Fans are encouraged to take public transportation to Oracle Park. Caltrain: Allow extra travel time due to the Caltrain Electrification Tunnel Work. Caltrain will have buses waiting at the Bayshore station for each train arrival. Most buses will provide direct service to 4th and King. Caltrain will have ambassadors on hand to help guide people to the correct bus. Due to construction activity around Oracle Park, fans are encouraged to park at Pier 30/32. Located on the Embarcadero at Bryant Street (entrance next to Red’s Java House), Pier 30/32 is a 10-minute walk along the waterfront to Oracle Park. Lot A and Pier 48 will be open, but capacity will be limited. In addition, lane closures on 3rd Street could cause increased congestion. Fans coming from the south should exit I-280 North from Cesar Chavez or Mariposa and access Lot A or Pier 48 via Illinois and Terry A. Francois Boulevard.